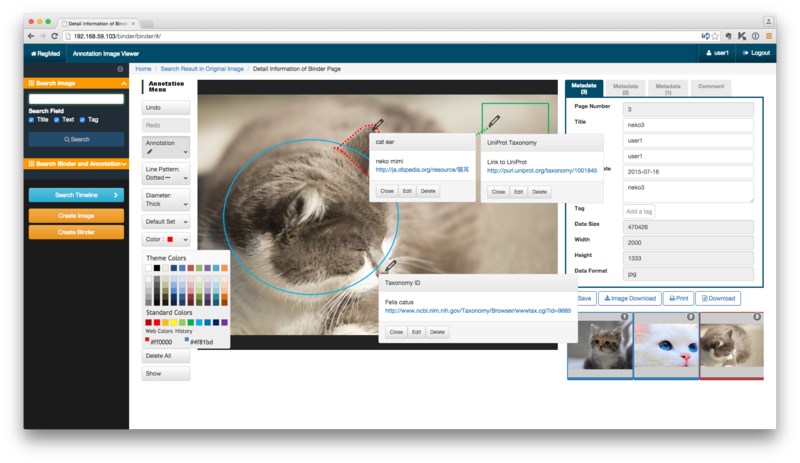 OpenIAV (Image Annotation Viewer) is a Web-based image annotation tool, it can store a high-resolution figure, and view scale-free slide smooth. This tool includes a rich user interface for graphical annotation such as a shape of a line, circle, rectangle, and color pallet. This viewer has an easy administration tool for user management. Additionally you can describe a annotated information for an image as metadata. M-1. Install "Command Line Tools for Xcode". M-2. Install a package management system of "Homebrew". M-3. Update the package of Homebrew. M-5. Install Boot2Docker and Docker. M-7. Check the IP address assigned using the command of Boot2Docker. W-1. Install application of "Windows Docker Client". W-2. Start Boot2Docker from the start menu. W-3. Make a note of the IP address and PORT of DOCKER_HOST displayed at the time of starting. LC-1. Update package of yum. LC-3. Set up to start Docker at the time of boot of CentOS. C-0. Register your account into Docker Hub. C-1. If you encounter the message of "Cannot connect to the Docker daemon. Is 'docker -d' running on this host?" then you execute next command. C-2. Login to Docker Hub. C-3. 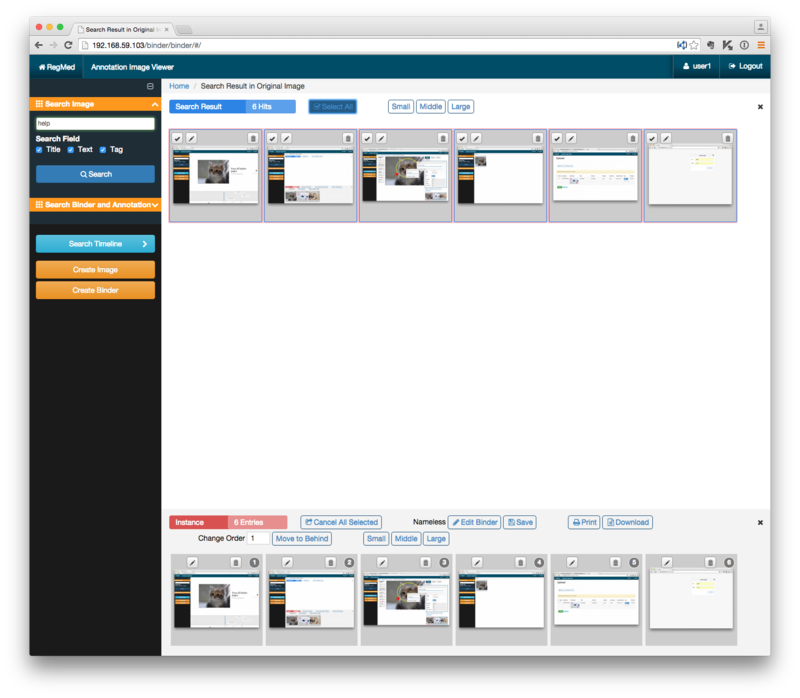 Pull container image of OpenIAV from Docker Hub. C-4. Check an information of container image. C-5. Start a container from an image as a daemon and assign HTTP port to the container. C-6. Check a sturted container. C-7. Access http://DOCKER_HOST:PORT/binder/login/ via a browser. C-8. Default user accounts were registered as each user roles. C-9. Set up the CONTAINER ID into an option parameter of docker stop command at the termination of a container. C'-1. If you encounter the message of "Cannot connect to the Docker daemon. Is 'docker -d' running on this host?" then you execute next command. C'-3. Load the TAR file in to your docker. C'-4. Check an information of container image. C'-5. Set a human readable tag to the loaded IAV image. C'-6. Start a container as a daemon and assign HTTP port to the container. C'-7. Check a sturted container. C'-8. 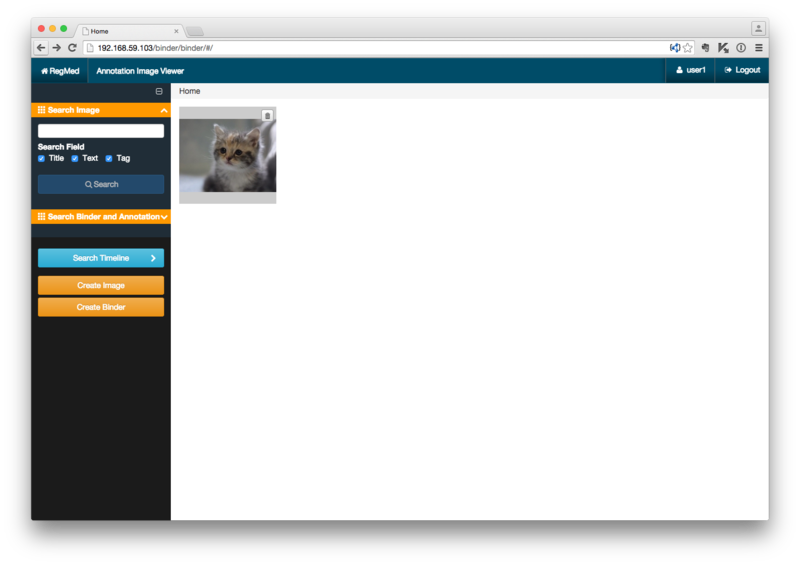 Access http://DOCKER_HOST:PORT/binder/login/ via a browser. C'-9. Default user accounts were registered as each user roles. C'-10. Set up the CONTAINER ID into an option parameter of docker stop command at the termination of a container. Click the "Local Login" button, and secondly, input the default user account and password such as "user1 : useruser" into the forms, and thirdly click the submit button. 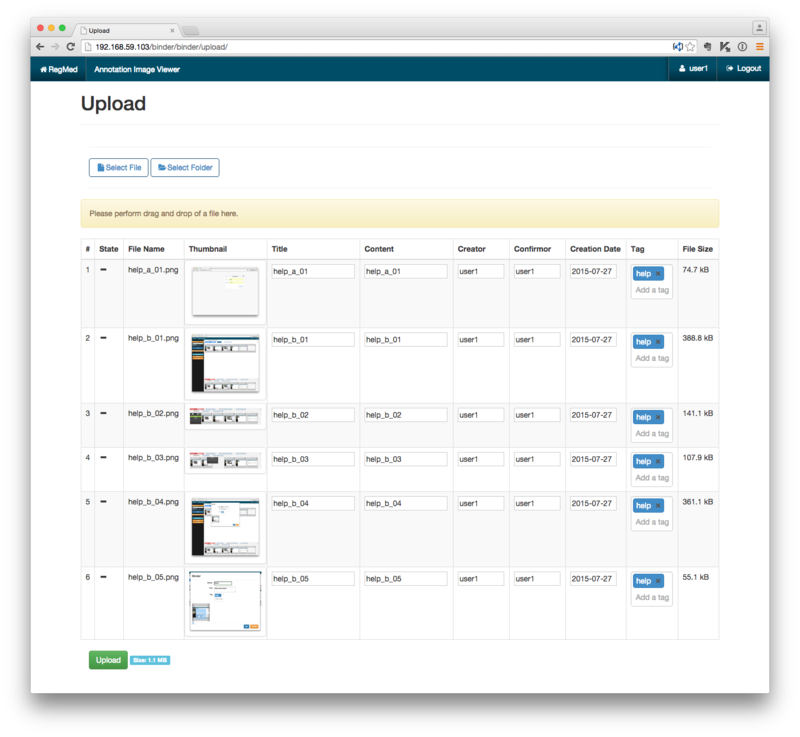 First, the tutorial explains about upload for your image files. Please click the "Create Image" button. In next screen shows "Upload" function. Please, choice upload way from "Select File", "Select Folder" and "Drag and Drop into the yellow area", and finally, click the "Upload" button. When you upload your files, a blue progress bar appears in the upper part of a screen. This screen shows an image selection scene, and it has two selectable regions. White region displaying the original images and a gray region is selected images as collected binder pages internal. Please select your target figures from the upper field, and copy the same images into the lower field automatically. You can start to annotate a binder image from the pen (edit) icon. If you want to remove a selected image from binder collection, then click the garbage (REMOVE) button in gray fields. However, in white fields, the garbage button is not the same function, it means a DELETE button of original image data from IAV database. Be careful of your actions. We explain each functional button. The "Cancel All Selected" button removes selected binder pages from the collection (gray field). "Edit Binder" button edits the information of a current binder and choices a cover images. "Save" button create and saves current binder. "Print" button generates a PDF file about series of binder image from the binder with annotation. "Download" button gives an original image and XML files. "Move to behind" moves a selected binder page from the initial position to behind the "Change Order" number. "Small," "Middle" and "Large" controls the thumbnail size in the both fields. If you need more display an area, then click the x (cross) button in another field. This operation executes an expansion or a reduction of one region. 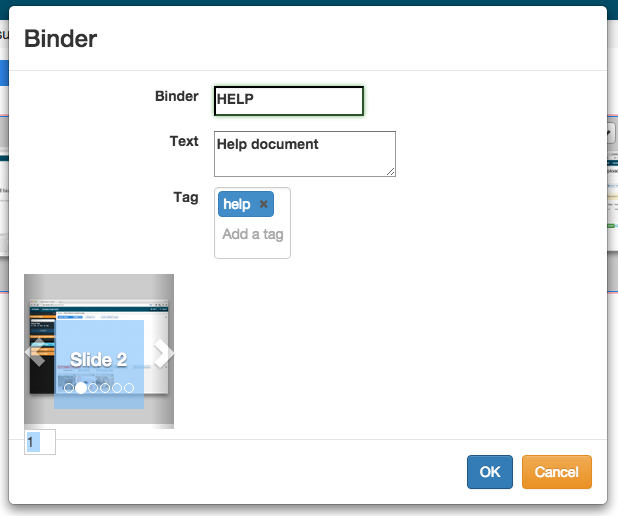 In a Binder region, it is available to replace an image freely by drag and drop. This screen is a binder image information, it includes a binder name, description text and tags. Besides, you can select cover image from the binder. The image annotation screen after selecting a pen mark. Attach annotation after selecting the Shape type and a color from an annotation menu. A comment and URL are recordable on the image coordinates on an image by selecting annotation. OS: Windows 7, 8.1 (64bit), Mac OSX (64bit), Linux CentOS 6 etc. (64bit); 32bit OS is not supported! CPU: Intel Core i 5/7 series multi-core processor, Xeon series. OpenIAV (Open Image Annotation Viewer) by RegMed Project is licensed under a Creative Commons Attribution 4.0 International License.